‘Lavender and Lace Wedding ceremony’ on Stone Bridge. 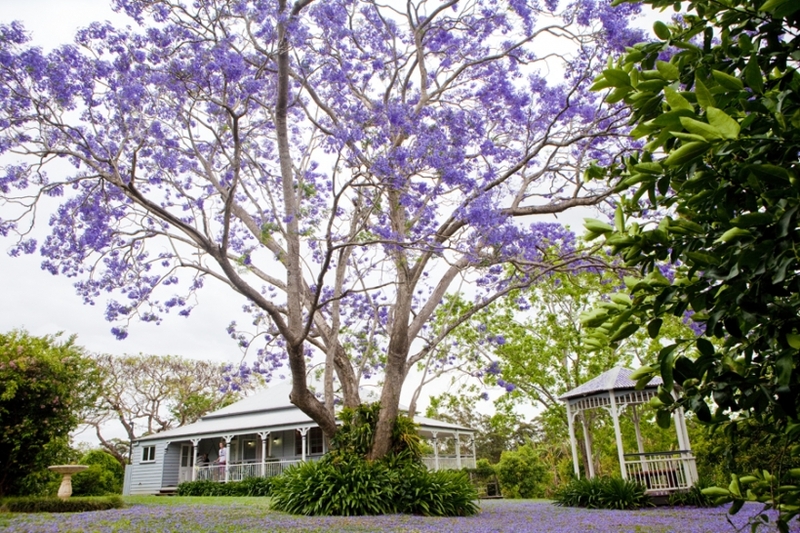 The magnificent jacaranda tree in full flower , carpeting the lawns of Dove Cottage with lavender blooms was the inspiration point for the styling and colour scheme of this beautiful garden wedding. The palette was lavender, mauve, purple, sage green , silver , beige and white. A gorgeous combination of antique furniture , silver , crystal and glassware with copious amounts of luscious cottage garden blooms gave a sophisticated French provincial feel to this grand old Queenslander nestled in a magic landscape of jacaranda blue . Rows of white mismatched country style timber chairs for the guests were set up in front of the ceremonial ‘altar’. Lace and hessian covered glass jars with fresh flowers created by Willow Bud hung from the chair backs in the centre aisle. The antique silver challices filled with gorgeous blooms arranged by Sandi from Willow Bud sat in resplendant contrast on the ‘altar’ created by two authentic old Bushells Tea chests. Sandi created absolutely exquisite bouquets for the bride and bridesmaid using purple lisianthus, anemones, mauve roses and hyacinths, white stock, freesias and an assortment of other exotic blooms and foliage. 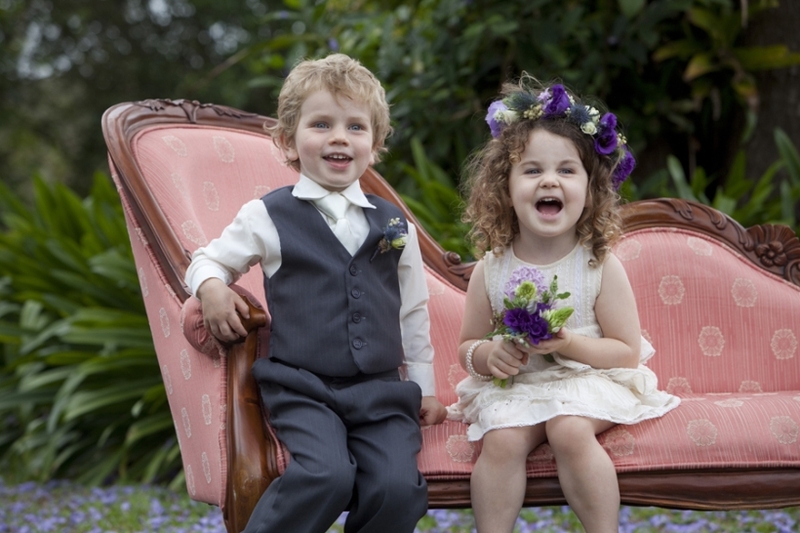 Sandi skilfully crafted a floral headpiece for Willow, the gorgeous little flowergirl, .Sandi also made a floral button hole for pageboy Orson’s little suit . How gorgeous do the children look! Thank you Tammy from Suits Direct for providing the boys suits . The bride looked amazing in a stunning white off the shoulder sateen gown created by talented Sunshine Coast designer, Marilyn Crystelle. Jenni, the bridesmaid also wore a pretty lace bodiced flowing gown in a soft beige colour which looked striking with the purple bouquet. I’d like to thank Anne from The Rose Room High Tea Cafe in Noosa for providing the beautiful vintage tableware and fine china, the bunting and lace tablecloths. The girls looked absolutely stunning thanks to the outstanding professional skills of make up artist Jacqueline Foster and hairstylist Paula Vasta. Thank you to Ellene and Peter of Mango Hill Farm for making us feel so welcome at their beautiful farmstay/ wedding venue . As Tisa and Todd can attest it is a perfect and very private venue to get married at. Thank you to everyone who worked so hard to make this styled event a success. My heartfelt thanks to the team: Tisa, Todd, Sandi, Marion, Anne, Jaqueline, Paula,Marilyn,Tammy,Angie,Caitlin, Tyson, Willow, Orson,Jennie, Ellene, Peter, Lorellie, Ammi, Jackie, Sarah and Cheryl. I hope I haven’t forgotten anyone. Very proud that our combined skills and creativity resulted in a styled event worthy of publication in the Bride’s Tree magazine. Thank you Jenny and Sally for giving us this wonderful opportunity to showcase our talents.